Just recently Facebook announced the “Nearby Friends” feature for mobile which essentially allows users to broadcast their approximate location, so their friends can search and see when they are nearby. Friends can now be notified when their friends are nearby for a meet up. The Facebook Nearby Friends feature is an optional feature, users can decide to turn it on or off at any time according to their convenience and for privacy concerns. You can also decide with whom you want to share your location with. You can choose from all friends, close friends, or a specific list of friends and allow them to know whenever you are nearby. For this feature to work, you and your friends will have to both turn on your Nearby Friends and choose to share your locations with each other. 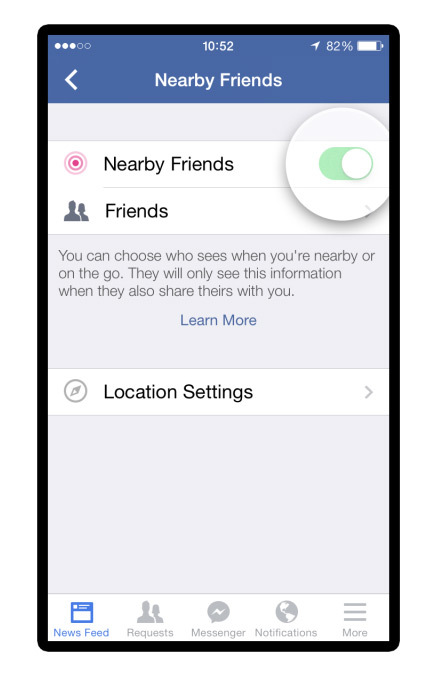 According to Facebook, you can also turn on Nearby Friends for a specific period of time or all times. While Facebook Nearby Friends is aimed at making friends even closer to socialize even more, it will also provide Facebook with lots of rich data on how users explore their immediate surroundings, opening a platform for targeted geolocated ads. Facebook’s “Nearby Friends” feature will be a major new opportunity for Facebook to push location-based marketing and advertising. With Facebook’s massive audience, marketers will most definitely jump into the location-based advertising wagon with Facebook. It won’t be long before you receive a notification about a happy hour sale from a store nearby. 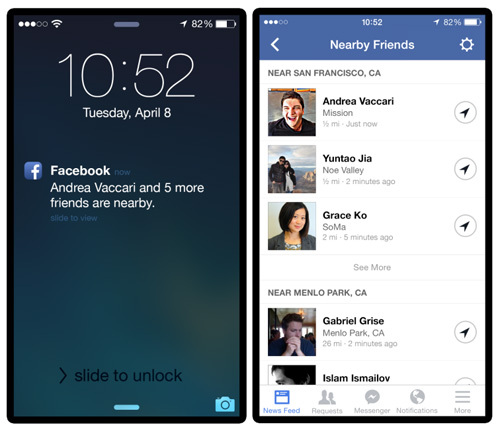 With Nearby Friends, Facebook is becoming So Lo Mo (Social Location Mobile). Facebook has integrated its social media platform and the physical location of its users with mobile technology, creating a social media app that is aware of your physical location and can interact with your mobile to create the best social media experience. There are a couple of So Lo Mo social media apps out there like Badoo and FourSquare, but these platforms over the years haven’t made much impact. Can Facebook do better? What do you think of the Facebook Nearby Friends feature? Well this might be the reason that I don’t see lot of new feeds on my wall. Seems like facebook is working on something big.